Alright…I’m back in the saddle after a crappy day…the ups and downs are really incredible when you think about them. Three things to note - (1) the incision was made on the inside of my leg, much farther off center than I thought. The doc said he does this as some people scar’s just don’t heal well and if it’s on the back of the leg, it can be irritating to skiing and snowboarding boots…good on him, didn’t tell him about my snowboarding..but appreciated the thought! (2) Had I known the incision was there, it would have answered my concerns about the feeling I’ve had for the past 10 days that my splint was digging into me…turns out it was the guaze pulling on the stiches a little! (3) Had I known, I probably would have been more comfortable resting my elevated leg directly on pillow, calf down. As it stands I’ve been either resting it to one side or the other, as I read somewhere that direct pressure on the incision can inhibit healing a little. 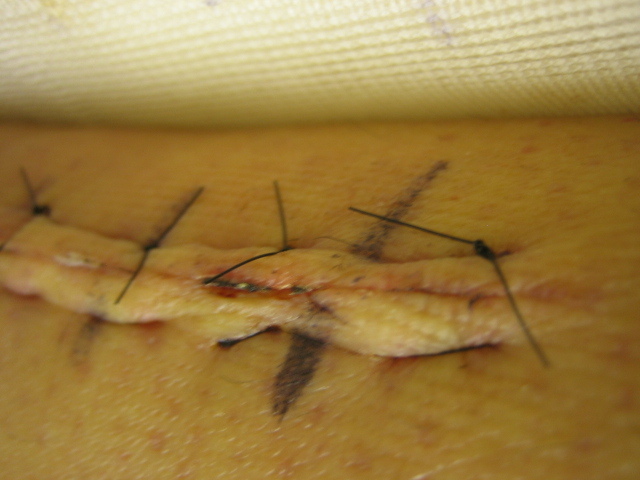 Here’s a shot of the incision…I was so relieved that it looked good. The yellowish is just a little internal bleeding that should go away in teh weeks to come. Here’s a real close up…sorry, if you don’t like the details! 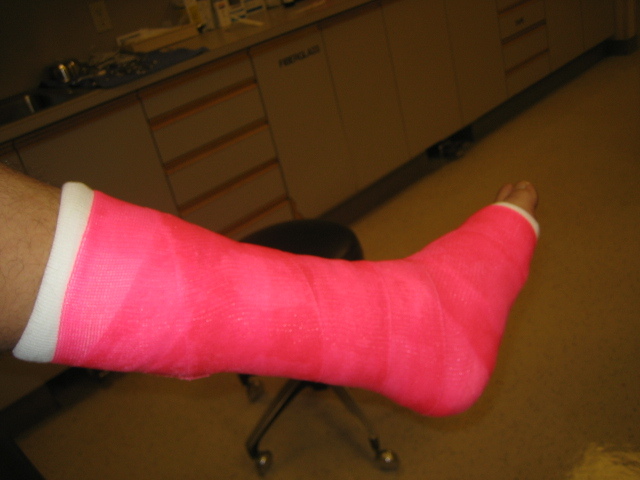 Alright, so looking forward - The ortho doc initially said cast for 4 weeks. I explained about my research, in a real unthreatening way, and that early mobilisation feels right to me. He was a little concerned as he had a patient that took this approach and was in a boot after 4 weeks, was at the gym pushing to hard and stretched the tendon at the repair site. It eventually healed, no true re-rup, but the tendon was not as tight as the doc would have liked. I said I wouldn’t be that guy, and we agreed that 2 weeks in a cast, NWB, and revisit. If after two weeks he and I are feeling good, we’ll move to a boot, still NWB, but at least allow me to start moving the joint around. So a really great conversation, and a big thanks to everyone on this board for giving me the tools/knowledge needed to have that discussion with my doc. I echo the comment someone made about being your own doctor…you really have to….and it helps to have a doc that is willing to work with his patients on a case by case basis. I’m so happy with the decision I made to switch surgeons initially! So in the next two weeks, got the OK to wiggle the toes, do the leg lifts (no extra weights), and get back to work. The cast won’t give as much with the swelling, so it will still be ice and elevation as much as possible. Wow..what a relief…I still can’t belief the tricks my mind was playing on me during those first 10 days….everything was going fine in there even though I was feeling all this nasty stuff…damn! A good milestone….here’s to the next steps (well..not quite yet literally)…. So glad the first visit went well and that you were able to communicate well with your doctor. I found the close-up shots interesting. (Memories of other wounds I’ve seen and also of dissection in college. Of course it’s related to that fascination/obsession with growths, fingernails, scabs, etc… that picking thing that Amy always teases me about). TMI, right. Most importantly, Bren, I’m grateful that you’re healing. The incision area looks really good. From the way you are describing your visit, you’ve made a great choice with the surgeon. Glad that you will be able to go into a boot in 2 weeks. You’ve reached a milestone, and it’ll get easier from now on. JS - that’s too much..I had tickets to the game tonight but decided to pass so that I didn’t have to put my leg on the shoulder of the person in front of me. Have fun! nice color! hopefully your girls liked it! 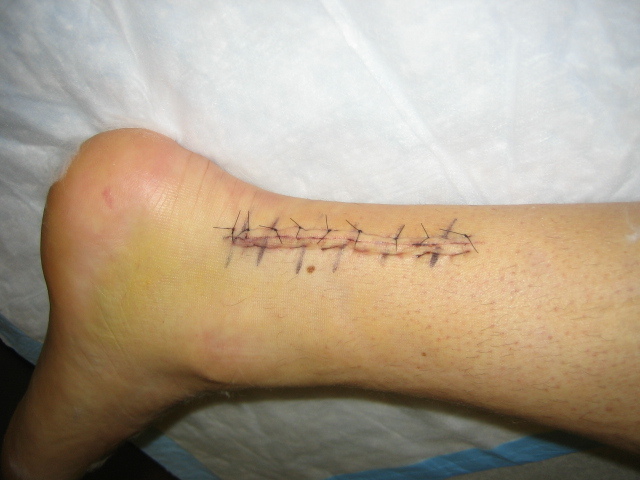 Hi Brendan, great pix, I get my staples out tomorrow, why do they put the ink pen lines across the incision? BTW, here’s my comment so you can get the email address. The line is there so that they can line up the incision area when they are stitching you back up. I’m so glad that you’re doing great. Hoping for your fast recovery and good health. Mike on Discussion Topic - Other AT/Re-Rup? Stuart on Discussion Topic - Other AT/Re-Rup? allen on Discussion Topic - Other AT/Re-Rup? Sean on Discussion Topic - Other AT/Re-Rup? 2 Years Later - Ironman, here I come!